My 5 year old has been all about rainbows lately. Ever since she learned the order of the colors, she has been drawing them non stop. I figured a rainbow craft (that was also a fine motor activity) would be perfect for her current interests and tie in nicely with St. Patrick's Day. And like most activities, this one did not go as planned. My 5 year old wasn't really into it and didn't even want to do it (maybe not the best timing after she had been at preschool all day) until she saw her little sister get into it. 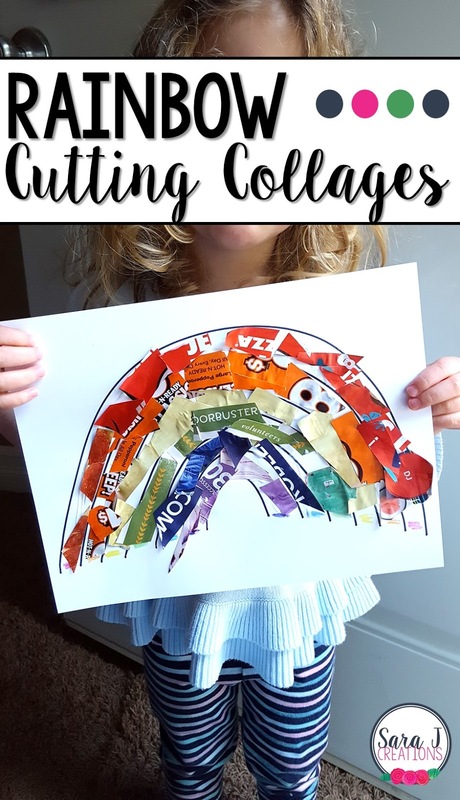 Miss Independent 3 Year Old TOTALLY rocked this rainbow cutting collage activity. I knew she loved scissors and knew how to cut from using our fine motor cutting box, but I was shocked with how well she did with this activity. To start I drew rainbow outlines on each of their pages of cardstock. I colored a little dot at the bottom so they knew which color went in which spot. I set out a stack of old magazines and advertisements along with bottles of glue and scissors. Then I left it open ended and told them to find the colors to match the rainbow, cut them out, and glue them to the correct spots. I did an example for each of them to get them started. In my head, I envisioned them flipping through the magazines and cutting out colors and gluing them down in a random order as they found them. Some blue here, some red next, then some green, etc. But interestingly enough, both girls were systematic in picking a color and sticking with it until that stripe was filled in. My three year old worked so hard on this. She easily identified the colors (which can be hit or miss with her sometimes - now I know she really does know them) and put them in the correct space. She also did a great job holding her scissors correctly and cutting out small(ish) pieces of the same color. I love this activity because it worked on so many skills at once - fine motor practice with cutting out the magazine pieces and gluing the small pieces onto the cardstock, as well as identifying and sorting by color. My 5 year old eventually got into it and completed her rainbow but my 3 year old was so proud of herself and worked so hard on this activity. This activity reminded me of the color books we made a few years ago where we cut colors out of magazines and made mini books for each color. Just another simple way to practice cutting and identifying colors. Another idea to use this for the classroom would be to make a giant rainbow and work on the cutting and gluing as a teamwork activity. Any bigger than this and my kiddos probably would have lost interest, but if they were working as a team to find and fill each color it would have been much easier.